First page, and I'm already in love. Not because of the characters. Not because of the big-time writer. But because of Mark FREAKING Bagley! ... Na, barely no one does. But I am a big fan of the New Warriors. So besides that his artwork is great, there is also a nostalgic mechanism in my brain that activates once it sees Bagley art and yells: "LOVE IT, DON'T ASK WHY!". Seriously, I could read a Frank Miller comic and STILL love it because I adore the artwork. So being objective can be a problem. But I will try. This comic is... different. We have seen journalists who are superheroes in comics before, but not superheroes who are journalists. You may think that they are the same thing, but they are not. Let me explain; Clark Kent is a journalist. There are many reasons to why he is a journalist, but one of them is that he needs a job where he can easily be close to situations where Superman are needed without his secret identity being threatened. It's a paycheck with benefits. But here, Jessica Jones is hired by newspaper BECAUSE she is a superhero. She is hired because of her contacts within the hero community. I honestly don't get why no one has thought of this idea before. And YES, I realize she is more like an analysts who assist a journalist, but you get my point. But if you are a fan of the series "Alias"(that I gave a rather harsh review the other day, and I consider rewriting it) I'm afraid that I must disappoint you; it's not a Jones series. It's a series where Jones is a character in it. And if you enjoyed her... colorful language(I didn't) then you will be disappointing yet again, since this is NOT a Marvel MAX series, but a mainstream one. All swearing is censored. This is not so much a superhero comic as it is a journalist series. It's about the newspaper the Daily Bugle. About Ben Urich, a reporter who has had... less than fortunate days, but now finally seem to get back in the game. About Jonah J Jameson, a man who fights a fierce battle in order to keep his beloved newspaper alive. 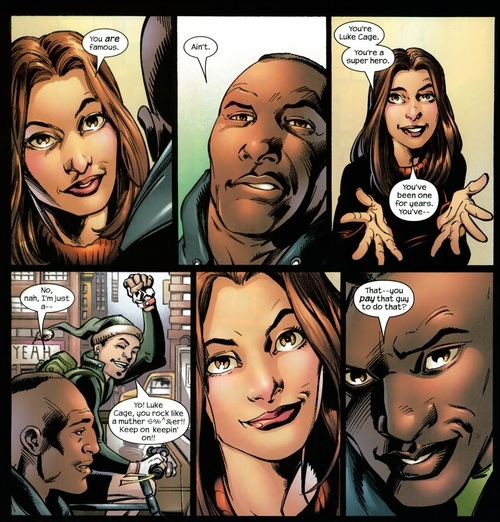 About what it means to be a journalist in the Marvel Universe. The series is far from perfect, sure. But the first 5 issues story-line is gold, possibly the best Bendis story I've ever read. I highly recommend The Pulse, especially the first TPB named "Thin Air". I can't recall the last time a comic could make me feel sympathy for JJJ.